The migration to newer versions of the Windows OS is inevitable, however not all applications will run smoothly once migrated to a new OS. One of the U.K.’s largest banking enterprises ran into compatibility and security challenges when they tried transitioning over 150 legacy applications from Windows XP to newer versions of Windows 7 and 10. 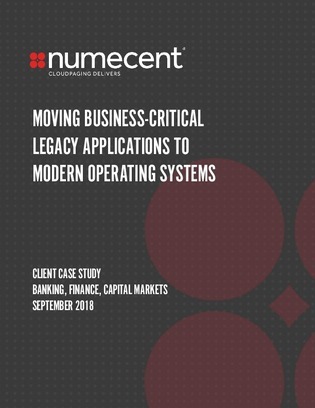 Download this case study to see how the bank was able to utilize a tool for migrating applications and easing delivery, deployment and provisioning from the cloud – to ease their migration of business critical legacy applications, while maintaining sufficient levels of security.